5 July 2016 Unlocked content from the archive. In One Photo, author Ross Watkins and illustrator Liz Anelli gently sketch a family affected by Alzheimer’s, though the disease is never mentioned in the narrative; rather, the young protagonist learns that Dad is becoming ‘forgetful’. In economical, honest prose, Watkins communicates the confusion, frustration, grief and, ultimately, love involved in gradually letting go of a family member. In fact Dad is almost entirely absent from the beginning: there’s no direct speech and, apart from the first and last pages, Anelli’s illustrations never show his face. Her images are filled with the detail and complexity of domestic family life—a lovely counterpoint to the sparse narrative. The monoprints are layered with rich, friendly, energetic collages of texture and style, echoing Dad’s proliferating photos of his world. Though the narrative is sensitive, its subject matter is still confronting and a tendency towards elision means the book will be best read with adults able to facilitate further discussion and explanation. 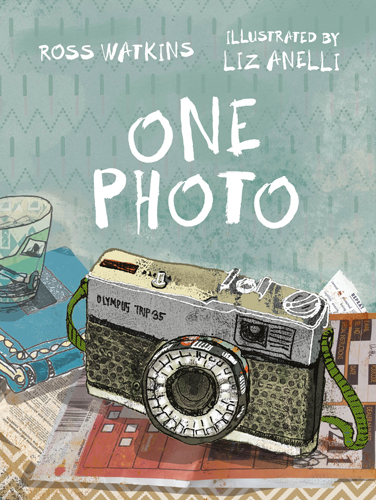 Like the unnamed protagonist, young readers may wonder why Dad becomes distant, but they will have no trouble sharing the joy Dad’s ‘one photo’ of the family brings them when he’s gone.